Being from the Midwest originally, we certainly have a special place in our hearts for ranch dressing. When we were growing up, it was a common dressing for salads and basically the only way we would eat vegetables. 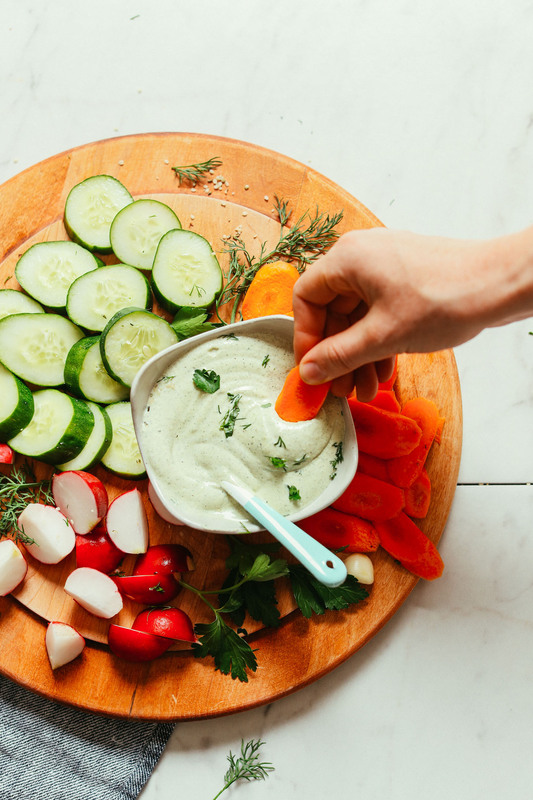 If you take a look at the ingredients of ranch dressing at the store, you’ll notice lots of dairy, processed oils, and other not-so-fresh ingredients. Let’s fix that and make our own! This 10-ingredient, 1-bowl recipe is made with items you likely already have on hand: cashews, lemon, spices, vinegar, and herbs. It starts with soaked cashews for the ultimate creamy base. We tested hemp seeds but found their flavor a little overpowering. So good ol’ cashews it is! 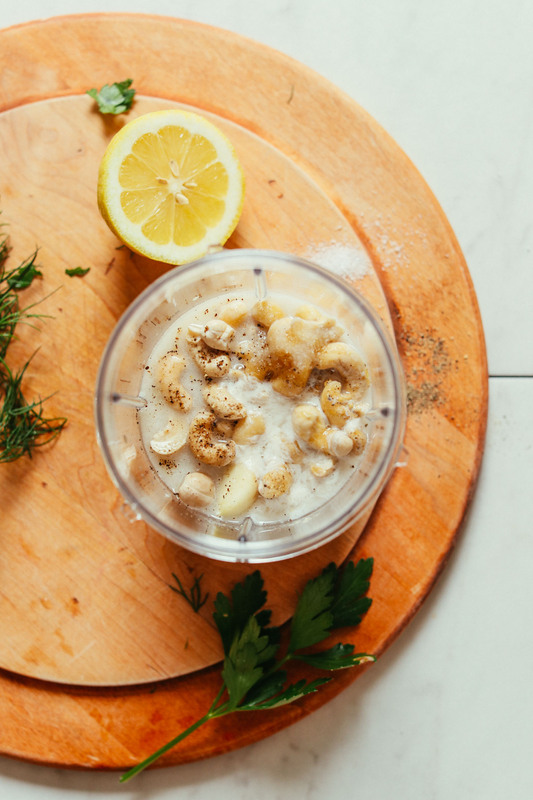 While the cashews are soaking, you’ll make “vegan buttermilk” with almond milk and lemon juice. Then simply add everything to a blender with your spices and herbs and you’re golden! Enjoy right away or chill to thicken. This would make the perfect sauce for salads like our Loaded Kale Salad or for dipping fresh or roasted vegetables in! It would be especially tasty with spicy things like our Buffalo Chickpea Wrap, and Spicy Red Curry Cauliflower Wings! Into easy sauces? 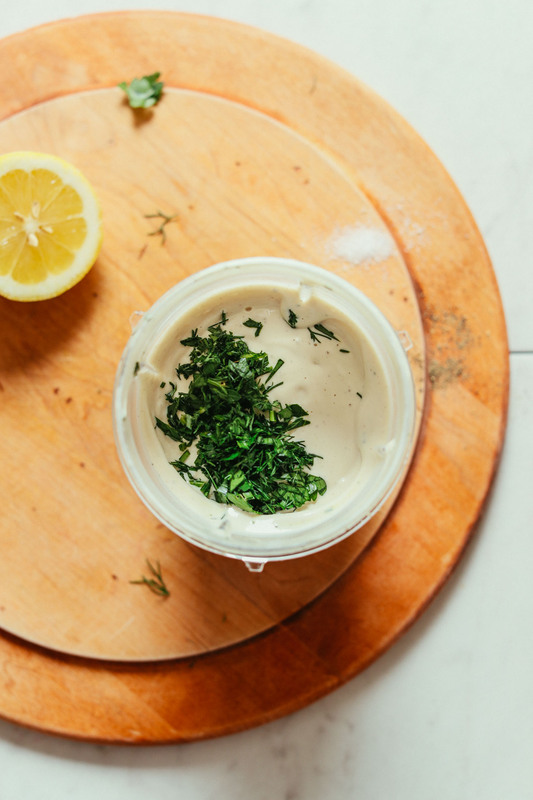 Check out our 3-Ingredient Tahini Sauce, Garlic Herb Dressing, and Easy Vegan Pesto! 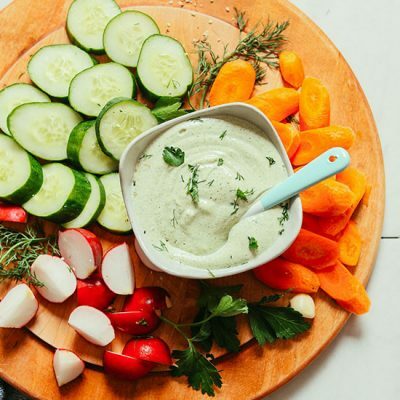 Creamy, oil-free vegan ranch requiring just 10 simple ingredients and 1 bowl with BIG flavor! 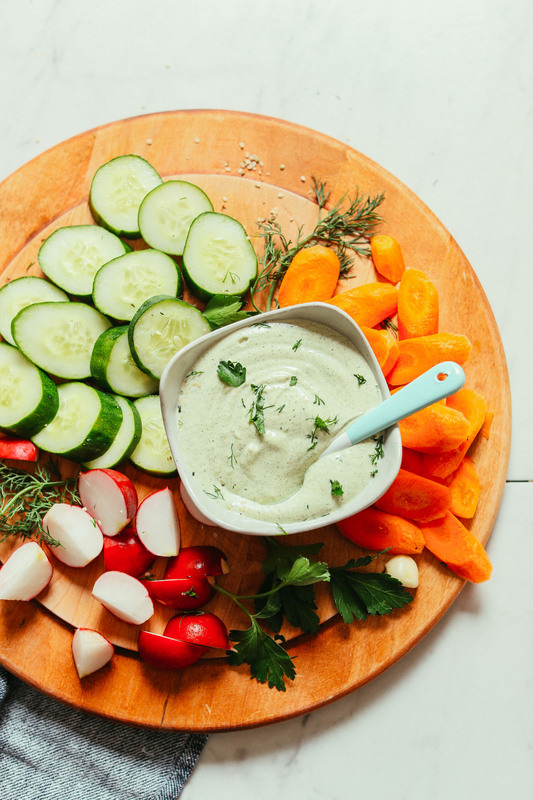 The perfect dairy-free dressing for salads, vegetables, and more! 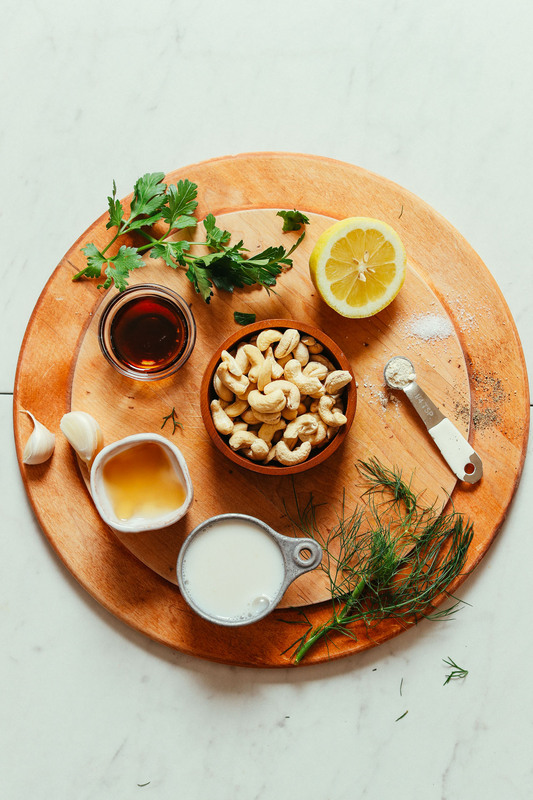 Soak cashews in very hot water for 30 minutes -1 hour (or overnight in cool water). While cashews are soaking, measure out almond milk and add lemon juice and set aside to curdle (this makes your vegan “buttermilk”). Drain and rinse cashews several times and drain again. Then transfer to a small blender (a blender is preferred over a food processor for achieving a smooth texture) and add almond buttermilk, garlic, salt, pepper, onion powder, vinegar, and maple syrup. Blend on high for 1-2 minutes or until very creamy and smooth. Enjoy with vegetables, salads, cauliflower wings, or pizza! Store leftovers covered in the refrigerator up to 7-10 days. Not freezer friendly (will likely separate upon thawing). *Nutrition information is a rough estimate calculated with lesser amount of maple syrup and without optional ingredients. *Recipe as written makes ~1 1/3 cups total dressing. I made this this morning and all I can say is – WOW! Absolutely delicious! And I haven’t even added the herbs yet because I need to go out and get them. So excited about this recipe! Thank you for posting it! Yay! Thanks for sharing, Annie! Turned out great. Added a little bit of smoked paprika. Would have started with half tsp maple syrup first. Whoop! Glad you enjoyed it! The flavor of roasted cashews could be too strong for this recipe. It would be best to use raw if you have access to them. Hope that helps! This dressing was really good. I subbed water because I didnt have any plant based milk and it worked out great. It has just the right smidgen of sweetness and the after taste is very satisfying. Will increase the garlic next time and add some chives. Smart! Thanks for sharing, Simone! 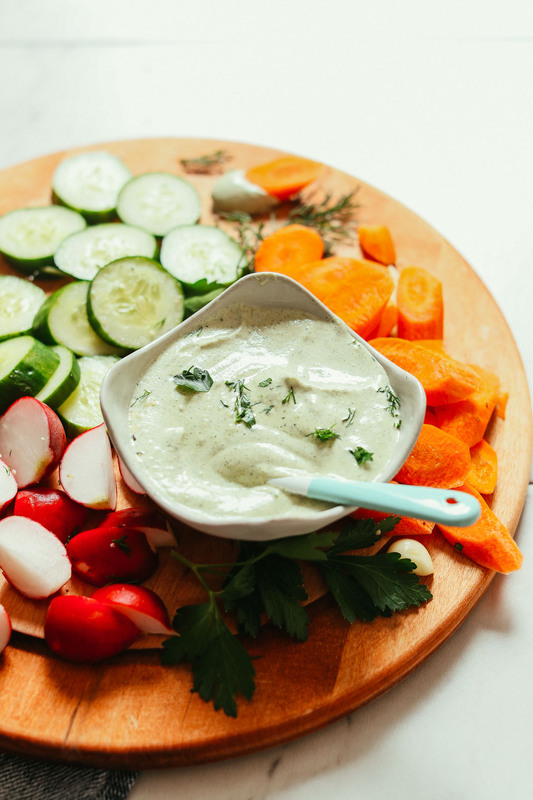 This is the best substitute I have found for ranch dressing/dip! Very good and easy! Next time I will omit the maple syrup. I used dried herbs because that is all I had on hand. I did add extra lemon juice, vinegar, and dill. We will definitely be making this on a regular basis in our house! Thanks! HALLELUJAH! This recipe is AMAZING! I’ve been trying to find a great ranch recipe ever since going vegan. I’ve tried tofu, coconut, store bought (you name it I tried it) but this is the closest thing to cow’s milk ranch I’ve ever tasted. The consistency and taste are all there! Cannot wait to use this on the buffalo chickpea sandwich recipe! Yay! We’re so glad you enjoyed this recipe, Caroline! I needed a quick sauce for steamed veggies and it was perfect (even though I skipped the syrup)! Yum! Glad you enjoyed it, Neri! This came out soooo delicious! I’m definitely including it for a holiday party I’m hosting. I’m allergic to almonds so I used unsweetened coconut milk. I also added a few more cloves of garlic. I may try reducing the amount of apple cider vinegar next time. Regardless, thank you! Yay! Glad to hear that, Molly! We’re glad you enjoyed it, Salvatore! Just made this and it’s great! Used agave but maybe should start with 1/2 tsp or use maple syrup. Added more lemon juice to combat sweetness…not a ranch maniac like many I know but this will be great for dipping veggies, etc. Thanks! Hi Sarah! Let it “curdle” for 5 minutes. I requested this on IG a while back! I’m so excited you created this recipe! I can’t wait to try it! I have made ranch many times with cashews. I really like this recipe! The lemon juice and the maple syrup brightens the flavor. Thank you! This looks absolutely fabulous, and I love that it’s so easy to make!! I will be making them for my upcoming housewarming party!! Always love reading your recipes for inspiration!! I doubled the amount of chives to two tablespoons, and also put two tablespoons of dried dill. I love my dressing extra “herby”. Fantastic recipe! This is so delicious! Thanks so much for this. All your recipes,are so good. 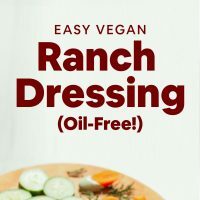 I just saw this and had to click, I’m not very fond of traditional ranch dressing, but I was curious about how the vegan version would be. I’m not vegan neither vegetarian but I’m cutting down my meat intake by 4 days a week and go meatless 3 days :) and I love the way you use vegetables and non-dairy options. I’ve lost 15kg so far and my gut health is doing great! Thanks, for such a practical and well-presented collection of recipes. It should be in the instructions. But essentially I do one cup store-bought or homemade almond milk + 1 Tbsp lemon juice or apple cider vinegar and let it “curdle” for 5 minutes. WIll amend! I’d say 10 days (maybe 2 weeks if it’s well sealed and refrigerated). What kind of milk would go with this other than almond, I really dont enjoy the texture or flavor of almond milk. Everything else sounds yummy! Thank you! Cashew milk or rice milk would be best. Hi, I was just wondering why this isn’t freezer friendly. Sorry, I’m not a very experienced cook. It may, but I just think it would potentially thaw weird. But if reblended once thawed, it might be OK! We have an allergy to cashews – would soaked raw almonds work instead? I’m going to try it with macadamia nuts. Will post if it turns out ok! Thanks for sharing, Heather! I fear that with macadamias they’ll never get quite creamy. Potentially same with almonds….let us know! Thank you! I got your message before I tried it and switched to 1/2 macadamia and 1/2 cashews and it turned out great! Most likely cashews would be better (I can’t eat them) but I was very satisfied! Thank you! Excited to have a new way to dress my salads. And thank you for ALL your recipies they always turn out great! Oops, I also used boxed coconut milk because I didn’t have almond. Would sunflower seeds work instead of cashews? If so, would they need to be soaked the same way? Would any other type of nut work in this? I have been looking for a ranch dressing for my son who is sensitive to dairy, eggs, canola and cashews. Unfortunately, the only salad dressing he likes is ranch. So, I tested it with hemp seeds and it did work (of course, they don’t need to be soaked, so keep that in mind). But it did have somewhat of an aftertaste. Perhaps you could try it with a base of silken tofu if you can do soy? Oh good idea! I’ll try that, thanks! Great idea! I have made potato salad dressing with silken tofu, so I think it would be a great alternative to cashews. Also good for those of us needing a lower calorie dressing/dip. Thank you for including info about how long it will keep and whether or not it is freezer friendly. I always wonder those two things with recipes, and it’s super helpful. Please keep up the wonderful recipes! We are so blessed by your creativity. It has made being *mostly* vegan with three kids SO MUCH EASIER. Do you think the volume of ingredients is too small for a Vitamix? Sounds delicious! It depends on the width of your base. If it’s skinny and tall, it should work! But if it’s like ours, the base is too wide and you’ll need a smaller blender. We’ve been digging the Nutribullet for smaller sauces / spice blends / seed meals and things like that! I made it in my blendtec tonight and it was the right amount! You shouldn’t have any problem. Can I use white wine vinegar? I have cashew yogurt, I wonder if that will work! Thank you for this this….its just wonderful! I never find a real Ranch dressing I like, it’s usually full of chemicals and processed oils! Ooh, I think it’d be worth a try! Let us know if you do.